HELP PLEASE!! Need some help from you experienced QBers!! Thread: HELP PLEASE!! Need some help from you experienced QBers!! *Would I "stitch in ditch" (never done) to attach layers together? any advice? Thanks so much for ANY insight you can provide! Think I would sew on a backing.....right sides together, leaving an opening to turn right side out. Blind stitch the opening. Maybe some quick meandering free-motion all over and then add a rod pocket to the back side. BTW....very cute fabrics.....great job! I like KR's suggestions. Also agree great job. Very cute fabrics!!! I know little of curtain making, just wanted to tell you how nice the quilt and the will-be curtain are. Yes, sew on a backing. That will protect the fabric from the sun. Turn right side out and stitch at the hem 1/4 inch away to keep it neat. You wouldn't want anything inside to make it too bulky. Tabs on the top would work, or the sleeve that was mentioned. I just love this! You did a really nice job with your colors and sewing! I would do a plain backing. If you have a strip left over that is wide enough to fold in half, I'd use that to make a casing at the top to be the rod pocket. Quick allover meandering would stabilize it. Good luck , it's adorable! Ooooo!! I love the sew together and turn inside out idea!! Wow...glad I threw this post out here!!! I'm not sure I could handle the all over quilting yet?! What if I did a cross (X) on each D9 square (so there would be 4 big X's and would be a big (forgive me if the term is off) cross hatch?? )...and would kind of match the X's on rag quilt?! Hmmm? Or would that be better on a smaller scale?! Thanks for the input and the kind words..they are much appreciated!! If you use regular curtain lining fabric, the curtain will last longer. Sunlight damages regular cotton fabrics in a hurry. I made such curtains for my kids' rooms when they were little, and they faded out in a year or twol I didn't line them at all. Your fabrics are lovely and I like the design you used. They are so cute! 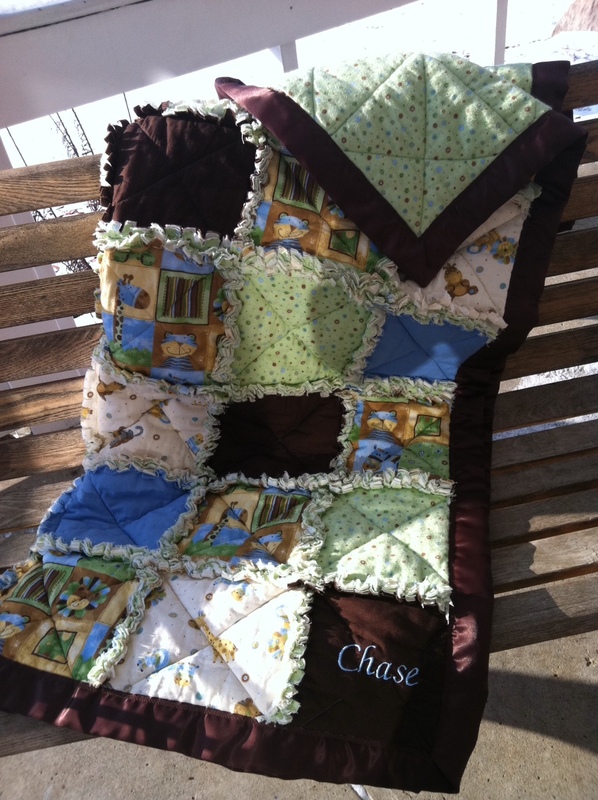 Chase will be kept very warm with that quilt. Love It! Yes, an "x" quilting design would be great -- I am not very experienced in machine quilting, and that type of quilting works nicely for me. If she wants it to be flat instead of flouncy, you might want a layer of fabric between the backing and front for more body. Maybe a pre-shrunk white flannel would give the desired look. Thanks so much!! I am feeling way less overwhelmed having some sort of idea going into the rest of this project!! Definitely line the curtain and add a rod pocket. Another suggestion would be to first sew the top seam of the two pieces right sides together then flip it over and sew the two layers together (sides and bottom) so both fabrics are on the outside with the same seam allowance you used on the rag quilt. Then fringe those three edges like you did the quilt--that really ties the curtain and quilt together. I've seen it done and it was so cute. Just another idea. This is the method I've used in to make curtains - Use a curtain or heavier backing fabric to protect you pretty fabrics. Cut the backing so it is 1-1/2" less wide that the front fabric, and 3/4" shorter. Hem both pieces along the bottom toward the wrong side of each of them. Sew the front & back together at the side seams. Lay them out with right sides together and distribute the extra front fabric so it is even on each side - it should be about 3/4" wrapped around to the back. Pin the top edge together and sew across the top, the turn the curtain right side out & press. I used pretty clips instead of a curtain rod - there's so many cute ones available now. OMG! You've made a wonderfully cute quilt!! The addition of the valance is a terrific idea! The mommy is gonna love it! 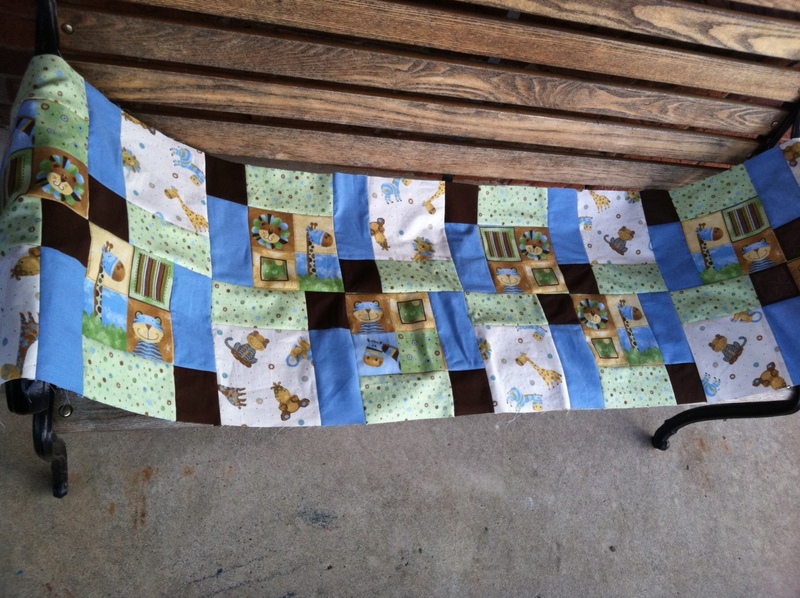 That is definitely a pretty baby quilt - I love it! The valance will be a nice addition. I'm not sure how many of you would check back on here so I posted a new UPDATE version (above) with new pics and thanks again for all your help!! I REALLY appreciate it! !